Something’s rotten in Cheyenne, Wyoming. 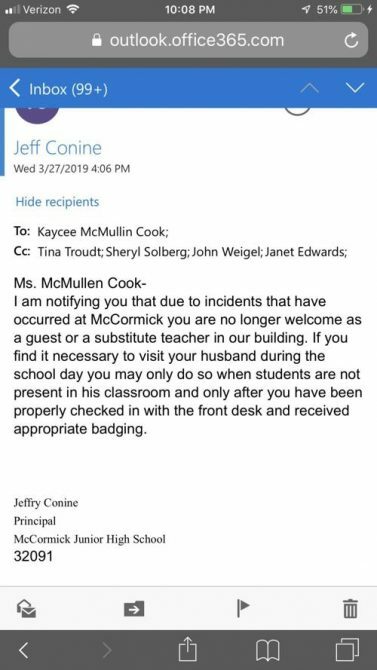 Racist and homophobic posters began circulating the halls of McCormick Junior High last week, and instead of doing anything about it, the school’s principal, Jeff Conine, decided to fire the teacher who brought the issue to his attention. 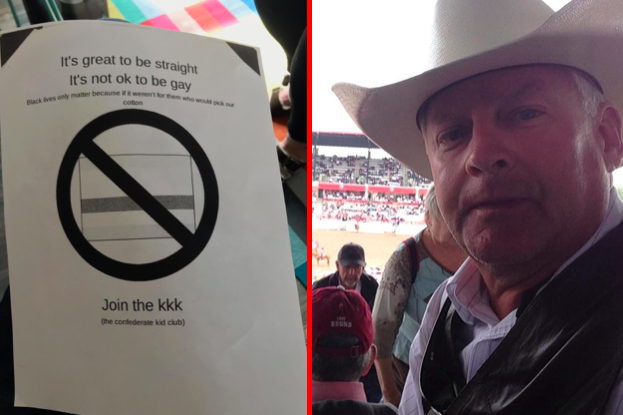 When substitute teacher and co-sponsor of the school’s gay-straight alliance Kaycee Cook saw the posters, she immediately reached out to Wyoming Equality, a non-profit organization that works to defend the rights of LGBTQ people in the Cowboy State. 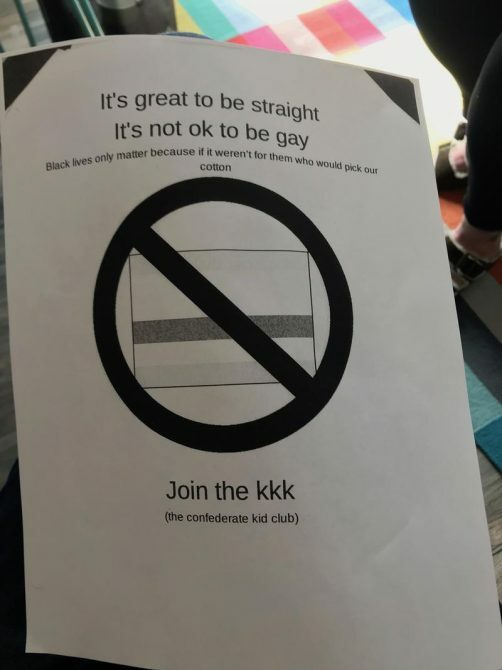 Sara Burlingame, executive director for Wyoming Equality, said the organization has received numerous other calls from parents and community members about the posters. The problem even got the attention of Cheyenne Mayor Marian Orr, who took to Twitter to respond to the situation. And here’s where the story takes an unfortunate turn. Because days after Cook contacted Wyoming Equality, she was abruptly fired from her job. Cook says she received an email last week from Conine informing her that she had been terminated from her position and was no longer welcome in the building. Cook tells Wyoming News that she believes Conine fired her in retaliation for being a whistleblower, even though she doesn’t believe she did anything wrong. Meanwhile, school district officials say they are investigating the situation. “In the midst of an investigation regarding inappropriate flyers that were posted at McCormick Junior High yesterday, (LCSD1) is offering support to our LGBTQ and black students who were reportedly targeted through the incident,” a statement from the Laramie County School District 1 reads. But Burlingame doesn’t seem hopeful that the situation will be remedied anytime soon. How can it be, she wonders, without the school’s principal on board? “Unfortunately, I don’t really feel the principal, Jeff Conine, shares that goal,” she says, adding that Conine’s firing of Cook makes it difficult to trust him. Conine, who has worked at the school since 1986, has been approached by several media outlets for comment but so far is refusing to say anything about the matter. Damn. If ever there was a douchebag look it’s got to be that. Simple good ol boy retaliation and the teacher has a good defence case I imagine. She said “This is unacceptable,” she says. “It does not reflect the values of Cheyenne.” Since the principal didn’t defend her I guess it DOES reflect the values in Cheyenne. There’s no getting around that. If any LGBT or Black students of this school are reading this We support you! While we don’t know for sure that was the reason she was banned, it does seem likely. But we don’t know all the details until the Board of Education does an investigation. Glad you provided that information. This has the appearance there are multiple issues with the principal’s opinion of this woman. Her husband also teaches at the school. Perhaps these two men don’t like each other. Perhaps her hiring was politically motivated and the principal resents her. I gathered that from the tone of her not being welcome in the building or to visit her husband. I think he was looking for a way to break this tie. Also, there may have been a policy in place where teachers must notify the principal before they contact outside groups about an internal issue at the school. At the least, this principal is a sorry POS. Fire the principal. Then lock him up in a Pilgrim-style shaming harness and invite students and faculty to throw eggs at him. HARD BOILED EGGS. All it confirms is that the principal is a disgusting POS. I doubt that everyone in Cheyenne is a POS. Remember, this is Wyoming we’re talking about; you know, a state known for killing gay people. Matt Shepherd was murdered because of backwards attitudes that, to this day, still permeate the state. This incident proves it’s still a dangerous state in which to be gay. As a retired school district administrator, I’d say that any responsible superintendent and school board should run this moron out of town on a rail. Guess what, Conine: When people read “Wyoming,” they still think “Matthew Shepard,” because of homophobic (and probably closeted) jerks like you. Adjust your collar, Jeffry (sic)…your red neck is showing. Wyoming is not unique. HATE has increased significantly, everywhere, since 2016. This is the same county Mathew Sheppard was brutally beaten and left to die tied to a freezing fence because he was gay. Even after all of that attention and education this Principal is still showing there are major problems in Laramie County Wy. While both situations are definitely terrible and Wyoming is struggling to address them, just need to clarify that Matthew was killing in Laramie, Albany County. This situation happened in Cheyenne, Laramie County. Thank you for the correction! I was mixed up about the locations!! Thank you for sharing this story. Kaycee was fired within an hour of Wyoming Equality meeting with the principal Jeff Conine. In the days since this incident, Wyoming Equality has attacked on social media and threatened multiple times. If you want to see the kind of comments we have been receiving, just check out the group Keep Wyoming Free. On Monday, I tried to go to work at the Wyoming Equality office and was told by the building manager that someone had come with a suspicious bag to our office earlier in the day and that it was not safe to be there. Did she go the principal first? This article makes it seem like she went straight to your organization instead of him. If that’s true he had a reason to fire her. No she reported it to the school first. She then sent it to Wyoming Equality since we help the state GSA chapters. Except you’re a liar. There is no agreement with a school that you cannot report bigotry and harassment. Your claim is the same B.S. colleges used to use to try to keep students fro reporting assaults on campus. @DCguy: what am I lying about? Troll tactic, pretend not to understand the simple tweet. @DCguy: I gave an opinion. It’s either correct or incorrect. How is that a lie? Jeff Conine needs to be dismissed immediately! This homophobic racist principal should not be around impressionable youngsters! perhaps the principal acted because she went outside the school structure to get resolution. she should have gone thru him to solve the problem? just speculating. in any case, firing too severe. I asked Alexa how many black kids go to the school she said 13..i feel for them. As well as the gay kids. …what a tiny minded c**t. And such a typical red neck—some people are really so brainless they ought be erased from the planet!…Some people are so sheltered and ignorant they do not know the earth is round. Truly. please post that assholes phone number.